AMSOIL achieves Absolute Efficiency with new filter line. Cellulose and blended medias found in most oil filters have larger fibers than the synthetic nanofibers found in the EaO Filters. They also have larger spaces between their fibers. This causes contaminants to load in the depth of the media and plug the oil-flow path, resulting in higher restriction and less capacity. The smaller fibers in synthetic media also have a controlled size and shape. This results in greater efficiency and capacity than cellulose filters, as well as better durability. 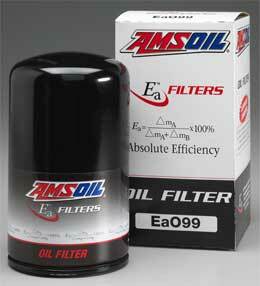 AMSOIL Ea Oil Filters provide a higher level of engine protection, as well as extended filter change intervals. Clean oil is vital to engine performance and durability. Oil must lubricate, cool and clean the engine as it circulates. In order to remain effective it must be filtered as it cycles. The filter is connected to the engine sump, which contains the oil pump. Full-flow filters pass all the oil output from the pump through the filter. The function of the oil filter is to remove the contaminants introduced into the lubricating oil and prevent them from reaching sensitive engine parts without restricting normal oil flow to the various points requiring lubrication. Internal sources of contamination include wear products from the rubbing surfaces of the engine, blow-by gases leaking past the rings of the pistons and degradation of the oil itself. A filter must perform well in the areas of efficiency, capacity, flow and life. Absolute Efficiency Efficiency is the filter's ability to capture contaminants. The more efficient a filter is, the more contaminants it will remove from the oil. To make a filter more efficient the spaces between the fibers in the media are made smaller, creating more resistance and limiting the oil's ability to flow through the filter. Achieving maximum efficiency along with limited resistance is critical to good filtration. Extensive testing shows that AMSOIL Ea Oil Filters achieve a near-perfect absolute efficiency rating. The exclusive new technology used in AMSOIL EaO Filters provides filtering efficiency to 98.7 percent at 15 microns. EaO Filters are the most efficient filters that are available for auto/light trucks. Maximum Capacity Capacity is the amount of contaminants a filter can hold and still remain effective. When a filter reaches maximum capacity the oil continues to flow through unfiltered, leaving harmful contaminants circulating in the oil. When a filter reaches maximum capacity it also reaches the end of its life and must be changed. AMSOIL EaO Filters have a far greater capacity than competing filter lines. When used in conjunction with AMSOIL synthetic motor oils in normal service, EaO Filters are guaranteed to remain effective for 25,000 miles or one year, whichever comes first. AMSOIL Ea Oil Filters are made with premium-grade full synthetic media. The strictly controlled processing of this media ensures accurate fiber construction and allows Ea Oil Filters to deliver higher capacity and efficiency, along with better durability. Over the service life of a cellulose filter, hot oil will degrade the resins that bind the media. EaO Filters full synthetic media technology uses a wire screen backing that is pleated with the media for superior strength. Ea Oil Filters are constructed with HNBR nitrile gaskets that are fully tested to extreme distances in numerous severe environments. The filters also feature fully tucked seams, a molded element seal, roll-formed threads and a long-lasting premium-grade silicone anti-drain valve. Proper oil flow is essential to keep moving parts lubricated at all times. A filter without adequate flow properties can cause catastrophic engine failure. Flow is restricted as the spacing in the filter media is made smaller to provide greater efficiency. The synthetic nanofibers in AMSOIL Ea Oil Filters allow maximum efficiency without restricting flow. This provides unsurpassed cold-start performance and ensures proper levels of lubrication throughout the engine. AMSOIL EaO Filters are guaranteed for 25,000 miles or one year, whichever comes first, when used in conjunction with AMSOIL Synthetic Motor Oil in gasoline and diesel vehicles in normal service. They are guaranteed for 15,000 miles for severe service. This coincides with the AMSOIL 25,000-mile/one year motor oil drain interval, adding even more convenience for motorists by consolidating routine maintenance. EaO Filters are recommended for use up to two times longer than OEM recommendations for commercial units, fleets and RVs using diesel fueled engines, not to exceed 60,000 miles for heavy-duty on-highway diesel applications. Synthetic media have submicron diameters (nanofibers) and small inter-fiber spaces which result in more contaminants being captured on the surface of the media and lower restriction. Cellulose fibers are larger and have larger spaces between the fibers, causing the contaminants to load inside the media and plug the flow path, resulting in higher restriction and lower capacity. Amsoil carries a complete line of filters from quality aftermarket manufacturers like WIX and MANN. Just use the Product Lookup Guide!